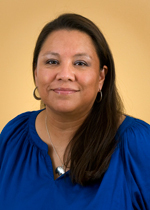 Felica Ahasteen-Bryant is the Director of the Native American Educational and Cultural Center at Purdue University. She is from the Diné (Navajo) Nation and was born and raised on the Navajo reservation in New Mexico. As with many tribal nations, she maintains a close connection to her family and honors the tradition of identifying her clans. She is from the Naashashi' (Bear) clan, also known as her maternal clan, and born for the Kinyaa'áanii (Towering House People) clan, also known as her paternal clan. Ahasteen-Bryant became the NAECC Director in June 2009 and is currently responsible for the daily operation of the Center and for the development and implementation of Native American cultural programs and events. She joined the Office of Multicultural Programs in the College of Agriculture at Purdue University in March 2007 and was responsible for recruitment and retention programs focused on under-represented populations within the college. Before joining Purdue University, she spent 10 years with Indiana University-Purdue University Indianapolis (IUPUI) in the area of undergraduate recruitment and early outreach programs with the Office of Undergraduate Admissions and the Enrollment Center. She maintains a strong relationship with the Indiana Native American community. Currently, she serves as the Vice President of the Indiana Native American Cultural and Educational Association and serves on several committees including the Eiteljorg Museum's Red/Black Exhibit Task Force, the United Way of Central Indiana Minority Volunteer Breakfast Committee and the Indiana Multiethnic Committee. She also has held leadership positions on the American Indian Center of Indiana Board of Directors and with the American Indian Theatre Company of Indiana and continues to serve as an advisor. 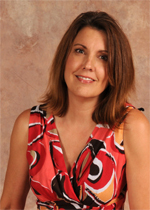 Ahasteen-Bryant received her bachelor's degree from New Mexico State University and her master's degree from Indiana University. As the Administrative Assistant, Deb Swihart's role is to support the activities and mission of the NAECC by working "behind the scenes". "I believe strongly in the importance of a welcoming, nurturing, and supportive environment for students, and I am devoted to making NAECC a home away from home for Native American students at Purdue," she says. "Individually, each of us brings special gifts to campus. Collectively, we can form a community that makes a positive difference for all of us at Purdue and beyond." If you have trouble accessing this page because of a disability, please contact the Native American Educational and Cultural Center at naecc@purdue.edu.